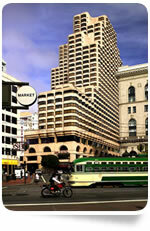 StoryWorld Conference + Expo will take place at Parc 55 Wyndham San Francisco – Union Square. An exclusive discount is available to StoryWorld attendees. Book early to reserve a discounted room at this luxurious, modern facility in the heart of the city. To book your room at the $184 StoryWorld discounted rate please DO NOT contact the hotel directly! All online reservations must be booked by clicking here or calling 866-934-4912. If dialing by phone you must reference “StoryWorld.” All reservations for StoryWorld are handled by an outside housing firm. Please contact us if you have any questions. The Parc 55 Wyndham is located in the center of San Francisco’s cosmopolitan financial district and adjacent to the renowned Union Square shopping and theater district. In addition to the world-class shopping and dining right outside your door, you’ll find plenty of leisure activities within walking distance or a short commute away in this compact, easily navigated city. The San Francisco Museum of Modern Art and the Yerba Buena Gardens are an easy stroll from the hotel, while famous landmarks such as Haight Ashbury, Fisherman’s Wharf, AT&T Park, Chinatown and the Presidio are two miles or less from the front door. Hop on the cable car or the BART (Bay Area Rapid Transit) for access to more distant attractions, such as Golden Gate Park. From San Francisco International Airport (SFO): Follow 101 North and merge onto Interstate 80. Take the Seventh Street exit. Merge right to Bryant Street. Turn left on Fifth Street. Cross Market Street. Fifth Street becomes Cyril Magnin. The carriage entrance to the hotel is on the left side of Cyril Magnin. Super Shuttle is available for $15.00 one way. The shuttle drops off and picks up in front of the airport every 15 minutes from 5 a.m. until 4 p.m. Reservations are required after 4 p.m. and can be made with the bell captain or doorman. All rates are subject to change without notice. From Oakland International Airport (OAK): Cross the Bay Bridge. Take Fifth Street exit. Turn right on Fifth Street. Cross Market Street. Fifth Street becomes Cyril Magnin. The Wyndham Parc 55 Union Square Hotel's carriage entrance is on the left side of Cyril Magnin. San Francisco Bay Area Rapid Transit (BART): Guests may board BART at the airport, taking any train heading toward Downtown San Francisco/Powell Street, including all of the following lines; Pittsburgh Bay Point, Richmond, Pleasanton, Dublin and Freemont. Depart the train at the Powell Street stop, the hotel is located just steps from the station. Sign up to receive StoryWorld information, news, updates, and stay on top of the latest developments. © Copyright 2011 F+W Media, Inc.